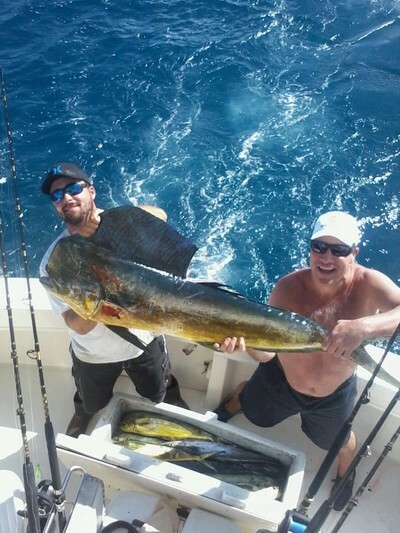 We are catching some decent Mahi-Mahi as the deep sea fishing here in Ft. Lauderdale continues to improve. Continued action on the smaller Blackfin Tuna, especially in the afternoons. Kings are biting a little better on the inside with an occasional big Bonito taking a bait as well. Happy to have them as usual, they pull hard and we can always use the strip baits we cut from them as we blow through them in big numbers throughout the course of a years charters. The really good news is that we had good success with the Mahi-Mahi on half day charters both yesterday morning and afternoon. 1st mate Brian and angler Brian who with his family chartered us holding the largest one in the pic. Good north current in the AM which faded out in the PM but the fishing held. Clean blue water inside and the Mahi were in it working over the Flying Fish. Small bunches moving to the South and in close from water from 150 to 400 feet of depth. We basically worked an in and out pattern across those depths and directly out from of our inlet. A slight increase over our typical trolling speed seemed to trigger aggressive bites. These fish did follow better than they have lately behind a hooked one and while only a few in each bunch they responded well (essentially well, as there was still some hesitancy probably due to the big moon) to live baits cast off the transom. But they do show that early/mid March tendency to get quickly back on their agenda and leave the transom and get back to their swim to the South. Be ready as that initial window can be small right now. Don’t overshoot these fish as Chris and I are finding them close in as we mentioned here off the Ft.Lauderdale area.